BioClass is a tool for biomedical text classification. Through it, a researcher can split a document set, directly related with a specific topic, into relevant or irrelevant documents. 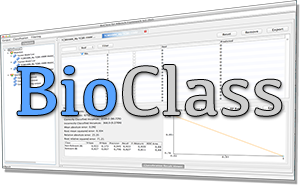 BioClass also supports several algorithms in order to increase the classification process efficiency and provides a set of powerful interfaces to analyse, filter and compare obtained results. In addition, all the operations than can be performed in BioClass are connected between them, so that the classification process is completely guided.